I had this idea not too long ago to start going through the meals I often had growing up in the Midwest. I realized a lot of the meals my parents cooked were not at all what my gentleband’s parents cooked. Our parents are very different from each other. For one, they’re from different eras, and I also grew up in the country while he grew up in a subdivision. There are a lot of factors to why we didn’t have the same meals growing up, but sometimes I’d ask if he had ever heard of a dish and every once in awhile, he hadn’t. If he didn’t grow up eating it, I started to survey the people around me. The thing I’ve learned about my parents as they’ve gotten older is they don’t really cook from scratch anymore. With getting older, my mom says her hands just don’t manuver like they used to, which is understandable. Through my pregnancy I’ve wanted to eat bowls upon bowls of comfort food, and a lot of those meals I had growing up in the Midwest were just that. Complete comfort food. But I wanted to perhaps take those comfort meals and use a few different ingredients to make them a little bit better to my tastebuds. 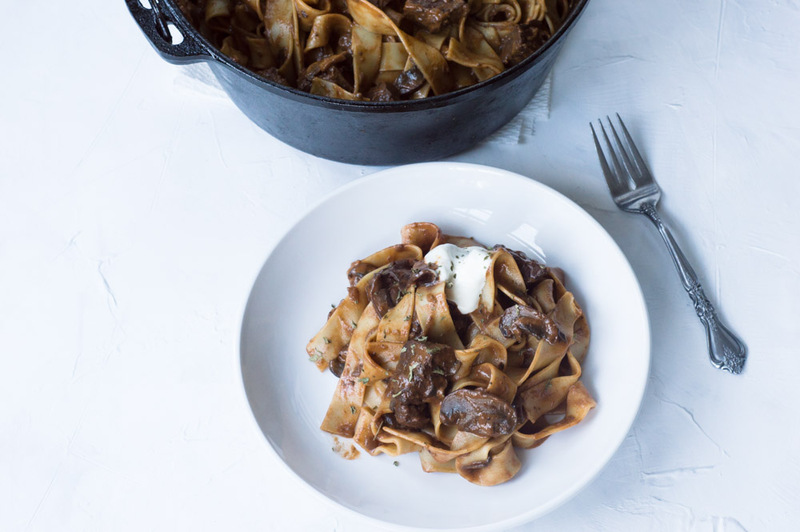 I started making a list, and the first up in my Midwest dinners is Beef Stroganoff. It’s funny because the name is very Russian, but I found that the Midwest probably put this on their dinner table more often than the Southerners I’m currently surrounded by. I asked my mom what all she put in her Stroganoff, and then I looked at a few recipes online and came up with my own. My mouth was ecstatic that it made so much and I was able to have so many leftovers. It was seriously delicious, and I told my gentleband I wouldn’t mind having this recipe memorized for those weeknight meals in the future when we just need something simple to throw together and eat off of. The only thing I’d change the next time I make this is I may get a different cut of meat. The meat I got pictured here was a very lean piece of meat, and I think I’d like just a little more fat for tenderness next time. 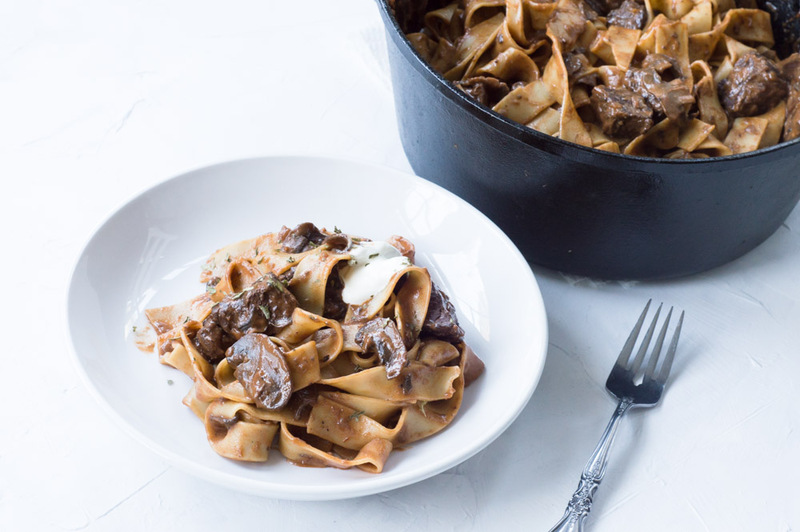 I hope you get a chance to make this, and please tell me if you grew up eating Beef Stroganoff! ∙Once your garlic and shallots have cooked a few minutes and they’re tender and fragrant, add in your mushrooms. I kind of just moved my mushrooms around until they were all coated with all the goodness from the pan. ∙Stir around and bring to a boil uncovered for an hour. ∙Cook for up to an hour, you may go over an hour if your meat isn’t quite at the tenderness you’re looking for. You’re wanting to reduce some of your liquid. ∙Once your meat is tender, add in your flour by sprinkling around the top. Mix it in and continue to simmer until everything has thickened up. Make sure that there’s no pockets of flour that didn’t get mixed in because that wouldn’t be pleasant to eat. 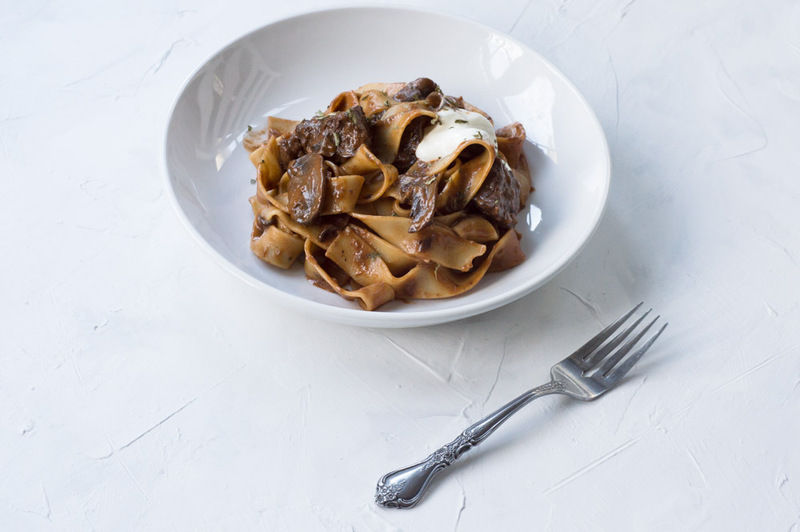 ∙While your mix is thickening, cook your pasta. ∙When your mix has thickened, remove from heat and add in sour cream. You don’t want this to continue to cook after you add in the sour cream because it’ll curdle if it boils. ∙Add in drained pasta and mix around until all pasta has been covered by sauce. ∙I served mine with some dried parsley on top and a dollop of sour cream. This looks phenomenal!!! I’m always in awe of the things I’ve seen you make! 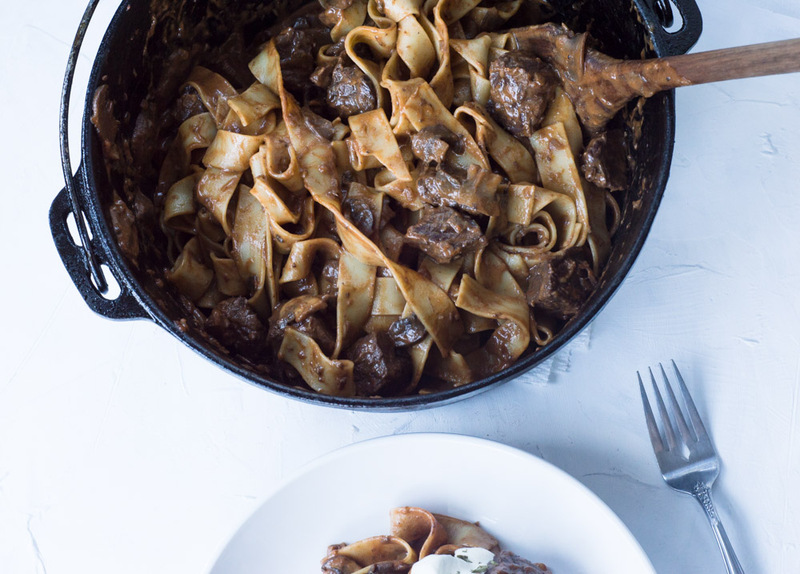 I never had beef stroganoff growing up! I tried it for the first time in my college years when Hamburger Helper and Ramen Noodles were cheap and easy! Hahaha! I would love to try this “grown up” version! haha! I guess I never thought about the very very cheap pre-made version of this would literally be Hamburger Helper.